Featuring the same one-piece 5mm thick curved-edge-design used in the S21T, the S16T is a full-sized chassis designed to fulfil all your hardware requirements. Access your collection of home videos for easy watching on your TV, or watch episodes of your favorite TV show back-to-back. Each player operates independently so you can watch different movies in different rooms. 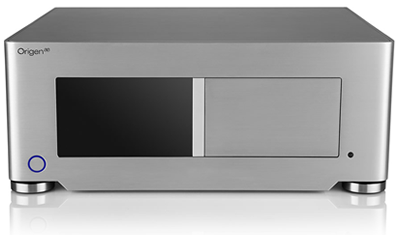 The S21T servers stores up to 60TB of digital content for Home Cinema viewing. The HDOrigen media server easily stores and catalogs hundreds—even thousands—of Blu-ray and DVD-quality movies. Browse your collection via our breathtaking and intuitive interface, or let yourself be inspired by movies presented by genre, director or actor. Gone are the days of digging through stacks of disc cases for the perfect movie night. To expand your choices, simply download Blu-ray quality movies from the Internet. HDOrigen interface will change how you think about your movie library. Perfect for those times when you don't have two hours to watch an entire film but want to enjoy a unique moment with family and friends, The HDOrigen interface lets you instantly jump to the very best moments in your favorite films. Think of it like skipping around and listening to only your favorite songs instead of entire albums. You can also jump directly to any episode of a TV series or even to your favorite song in a concert or musical. They're your movies, like you've never seen them. The HDOrigen System is designed to allow you to watch movies & tv shows in pristine Blu-ray quality no matter where you are in the world. Our Mobile and Tablet applications give you instant access to your collection so you can catch up on that episode you missed while you travel. Designed for virtually unlimited scalability, HDOrigen systems accommodate a large number of rooms and movies. One owner has 96 players, for example; another has over 15,000 movies. However big your home theater dreams may be, the HDOrigen systems are designed to make them come true. To help you build the ultimate collection, HDOrigen offers curated movie collections, each with a distinct focus. Explore "Godfather Collection," and discover a new fantasy favorite. Browse in Genres and uncover the finest Blu-ray content has to offer. Or check out "Movie releases by Actor" and experience Hollywood at its best. A great way to build your personal movie library, these collections are carefully curated by our expert team of movie buffs. Not content to settle for an off-the-shelf operating system, the HDwizards team & PLEX inc built a flexible, yet incredibly stable, software foundation from the ground up. PLEX, is the base upon which the entire HDwizards experience is built. PLEX not only allows you to automatically receive system updates and Movie Guide data for newly imported films, but it also takes advantage of HDwizards round-the-clock monitoring capabilities of many critical system functions. Delivered over the Internet as automated updates, past PLEX releases have introduced HomeShare, Content filtering & HDwizards sync the ability to automatically replicating content from one server to another server.